PHOTO COURTESY TRISTRAM KENTON School of Rock original London cast. Thursday, 7:30 p.m.; Friday, 8 p.m.; Saturday, 2 p.m. 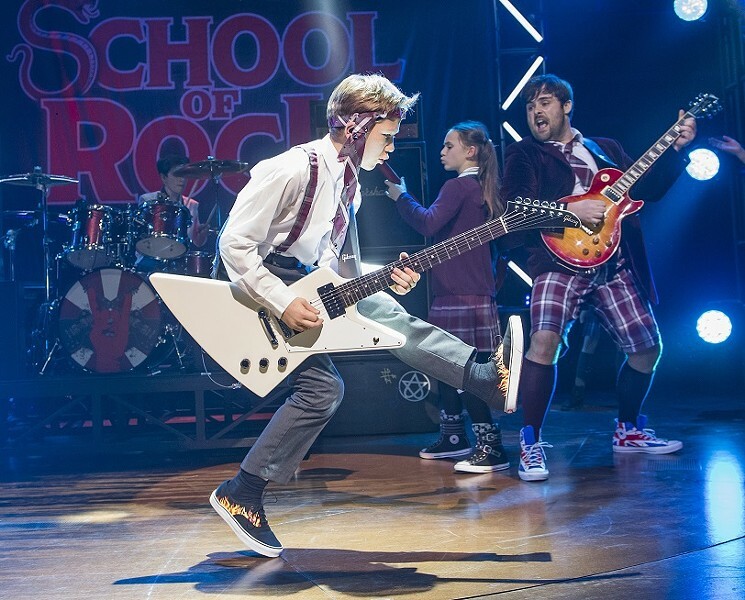 The RBTL ushers in their 2017-18 season with "School of Rock," making Rochester the Tony-nominated production's first stop on its debut national tour. Adapted from the crowd-pleasing 2003 Richard Linklater comedy starring Jack Black, the film's been transformed into an equally crowd-pleasing stage musical that had the audience at the Auditorium Theatre on its feet Tuesday night. The stage adaptation has a rather unexpected behind-the-scenes pedigree, featuring music from Andrew Lloyd Webber (with lyrics by Glenn Slater) and book by Julian Fellowes (yes, the creator of "Downton Abbey"). Webber and Fellowes likely aren't the first names one would think of to adapt a goofy rock comedy, but they acquit themselves quite well, delivering a gleefully good time at the theater. Updating the story only with a few modern technology and pop culture references, Fellowes hews fairly closely to Mike White's screenplay to tell the story of wannabe rock star Dewey Finn (played by Merritt David Janes at Tuesday's performance). A loveable manchild who refused to ever grow up and leave rock god dreams behind, Dewey lives with (and happily mooches off of) his best friend Ned (Matt Bittner). Ned's nagging girlfriend, Patty (Emily Borromeo) has grown fed up with his freeloading ways and inability to pay rent, and wants him out. It's here I note that -- though well-performed by Borromeo -- characters like Patty always make me a little queasy. You've seen its type a hundred times: a shrewish, career-minded woman who exists to be a source of derision until the audience inevitably gets to cheer when she's finally told off -- twice in this case -- by the men around her. And yes, the character is a carryover from the film, but I can't help wishing that Fellowes had found some way to add even a little shading to her. The plot kicks in when Dewey answers the phone for one of Ned's substitute teaching calls, and sees an opportunity to make some money. Passing himself off as Ned, he accepts a temporary job teaching fifth grade at the Horace Green prep school. Dewey immediately tosses the curriculum out the window, nixing the mathematics and social studies to focus on a lesson plan devoted exclusively to learning how to rawk. When he discovers that the tykes have some natural musical talent, Dewey sets about secretly remaking them into his own personal rock band, preparing them for a battle of the bands competition he already had his sights set on as a way of getting back at the band he formed, but was then tossed out of. Along the way, he must also avoid getting into trouble with the school's buttoned-up principal Rosalie (the wonderful Lexie Dorsett Sharp), who thankfully gets to be more of a human than poor Patty. Dewey's played with schlubby, charismatic charm by Janes, even when the performance occasionally falls into the trap of too closely mimicking Jack Black's manic original. The actor is exceedingly likeable, helpful for a character who could easily cross the line into being unbearably obnoxious. Even better, he's generous about ceding the spotlight to the production's cast of superbly talented youngsters. The production wisely knows that the kids are the real stars, playing their own instruments, and completely stealing the show, much to the delight of Tuesday night's audience. They're all wonderful, though the standouts for me were Ava Briglia as the class resident type-A personality, Summer (who becomes the band's manager, naturally), and Theodora Silverman as the too-cool-for-school bassist. Dewey teaches them to loosen up, enjoy occasionally coloring (or strumming as it were) outside the lines, and indulge in some mild rebellion (a lesson he imparts in the catchy "Stick It to the Man"). And as the kids unleash their inner rock gods, they manage to teach him just a bit of discipline and how to care for someone other than himself. "School of Rock" doesn't deviate from the film's plot, but it's one of the more successful screen-to-stage translations I've seen. What worked about the film was that it was sweet without ever getting too sappy, and Fellowes for the most part gets that mix exactly right in the stage version as well. The exuberant, feel good show wants nothing more than to teach the youngest in the crowd about the sweet freedom and head-banging joys of rock 'n roll. Judging by the little girl seated behind me who enthusiastically turned the seat back into her own personal drum set during the lively curtain call: mission accomplished.